Our Centerstage Professional Cotton Candy Machine Table-Top model will produce up to 120 cones per hour. Bring the midway experience to your home or business with this industrial grade cotton candy machine manufactured by HTD Canada. The unique design features a large 3 compartment drawer to hold extra supplies such as floss, cones or bags. The simple two-switch system allows for easy operation. It comes complete with the removable aluminum bowl and plastic mesh and clips to assist with catching the cotton candy. An optional acrylic dome is available to guard against debris and contaminants . 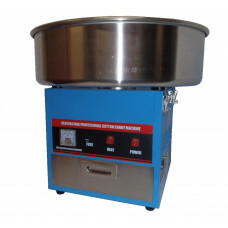 Weighing just 25 pounds therefore it is very easy to transport Our commercial grade maker is belt driven to limit vibration and motor noise, heats at a powerful 1080 watts and the spinning head is removable for easy cleaning. Ideal for Home and Commercial Use: Home Theaters, Schools, Arenas, Convention Centers, Zoos, Midways, Concession Stands, Snack Bars, Rentals, Trade Shows.